Across the border from Tooleybuc on the Murray Valley Highway, this small town, set amid irrigated farms growing citrus fruit and vines. 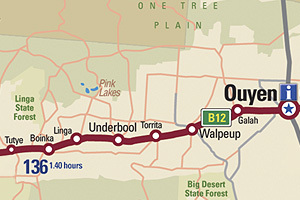 Piangil is also a junction for the Mallee Highway to Ouyen and South Australia. Major Mitchell Trail From Lake Boga northwards the Murray Valley Highway virtually follows Mitchell's original trail. North of Piangil there are several signposted detours to points of interest. The first is to the Major Mitchell Lagoons, where the party camped on 16 June 1836. The Lagoons comprise several backwaters, or billabongs, which were once part of the course of the river. Two wooded islands have been left isolated. At the car-park, which overlooks the lagoons, there is a picnic area with tables, fireplaces and toilets. From here a short walking track leads to an information shelter with details of Mitchell's journey and, further on, to the Murray River. It is fascinating to study Mitchell's drawing of the lagoons and compare the site today, it has hardly changed, except that citrus orchards are established on the higher ground. You can return to the highway by retracing your tracks or by turning right at the first 'T' intersection. It would be risky to try the road in wet weather. 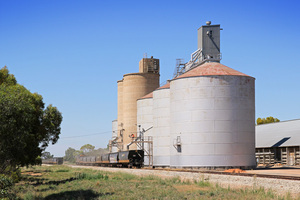 This road offers a diversion to the Wakool Junction or continues to the highway at Piamble. Passage Camp This historic site is clearly signposted, by the special Major Mitchell Trail sign. The track is passable in good weather, although care should be taken in winter and spring, or after heavy rain. Along the track another signpost points to the Murrumbidgee Junction. Keep to the left for Passage Camp. Mitchell's Passage Camp (13-15 June, 1836) was in a setting of river red gums, and today fireplaces are provided for campers, but there are no toilets. For the energetic there is a 6 km, marked, walking trail leading from the parking area at Passage Camp back to the old Narrung town site near the Murray Valley Highway. Approximately 9.5 km from Piamble a track to the right leads to the junction of the two rivers, The Murrumbidgee is small against the Murray. The drive to the junction winds through state forest of river red gums and past the site of the former town of Narrung. There are numerous tracks in the area so choosing the 'most used' is a good principle to get to the destination.